It was "Math with Malke" day in my daughter's 3/4 class! 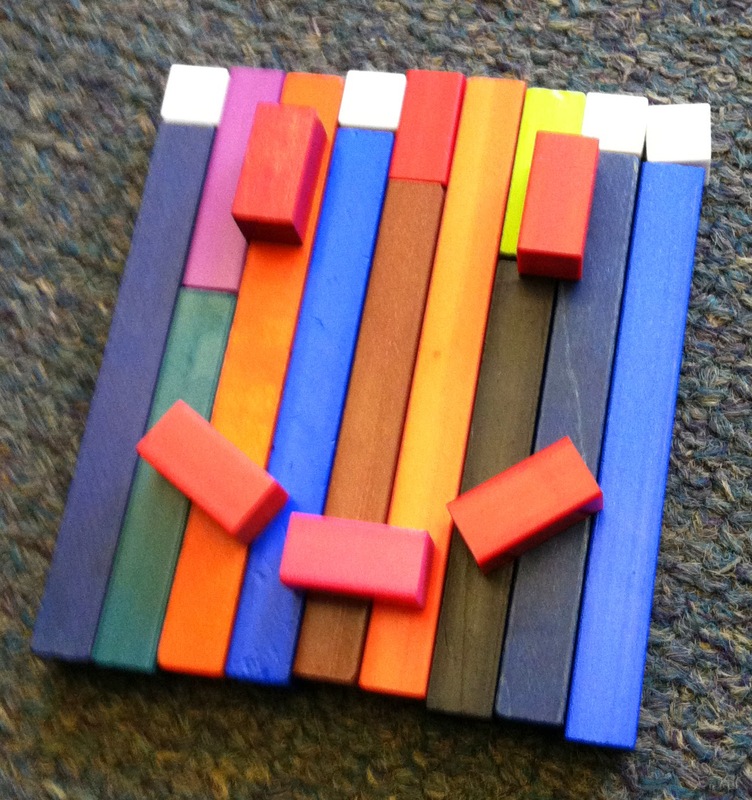 This activity was inspired by Simon Gregg's ongoing Cuisenaire Rod work with students; it was one recent conversation in particular about some "faces" that had shown up during one of his classes that got me thinking. 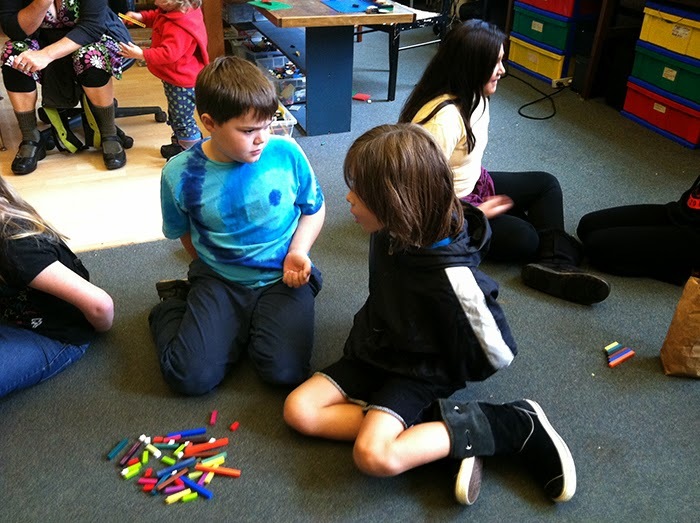 Because the kids' exposure to the C-rods was limited, I wanted to give the third and fourth graders a short intro to the rods before presenting the project. I built a sequence of simple investigations that led up to the big challenge. 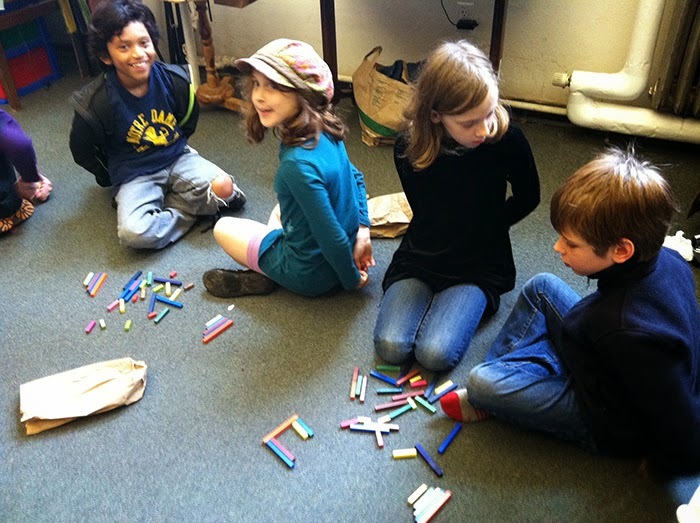 Kids were split into (semi) random pairs; each group got a bag filled with a random amount of C-rods. I asked them to open the bags and find one of each color. To give them some tactile experience with the lengths/amounts of the rods I had them pick up white, red, light green and yellow rods and put them behind their backs. They faced their partners and gave a series of commands: "Show me...green!" "Show me...white!" As a final introduction before the face making I modeled adding the rods together, white to orange. Then came the challenge! 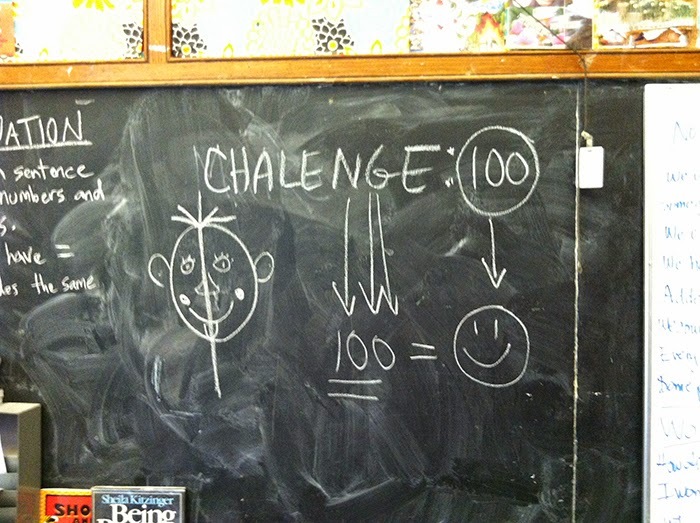 Make a face that "adds up to 100" or as close as you can get. Constraint #1: Use only the rods in you bag. That's it. Off they went! 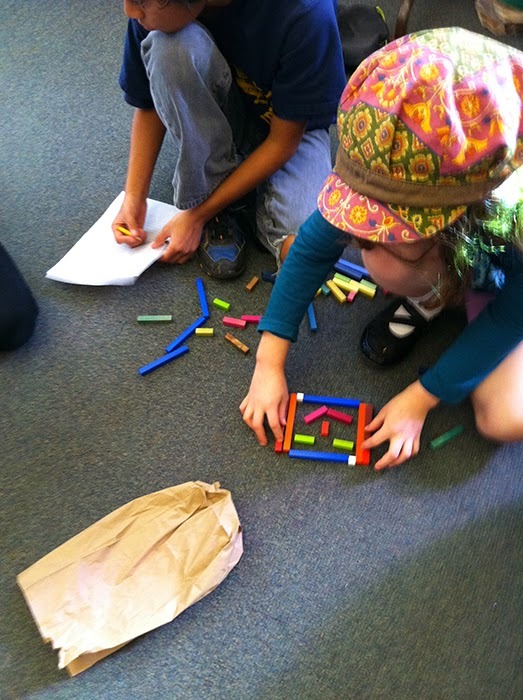 Some groups added as they built and found a need for paper and pencil to keep track. Some kids went immediately for the tens which made for easier counting. 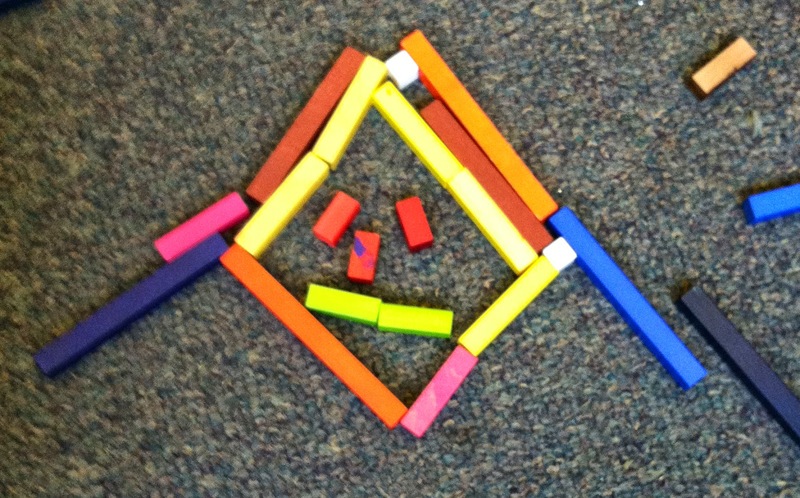 Some kids built first, counted second and added or subtracted rods as needed. 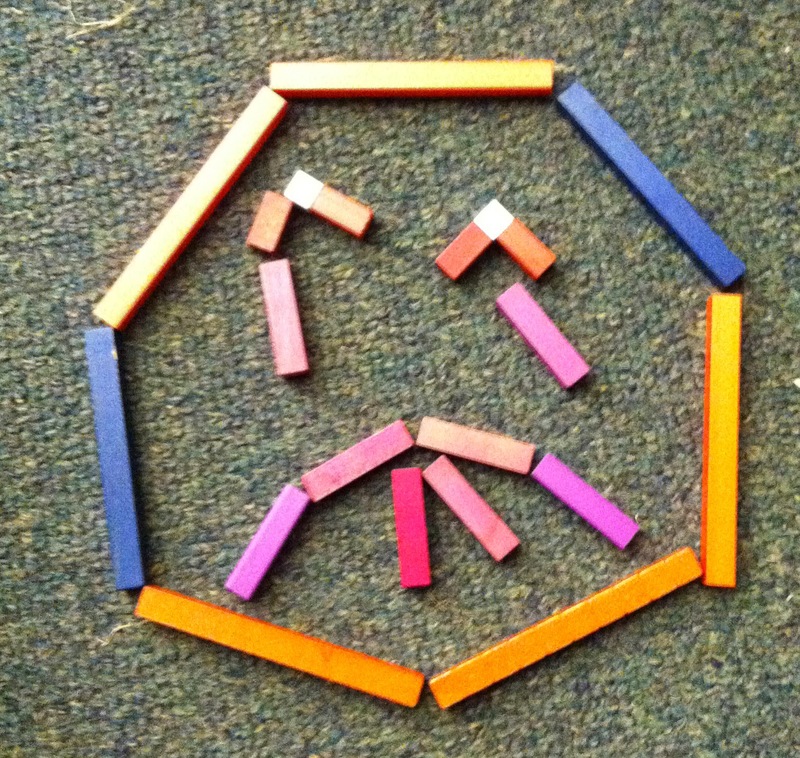 Some kids just made awesome faces. Me: "Hmmm...that looks like it's more than 100. What are you going to do?" Kid: "I guess we'll take off the hair." Some faces were closed (all rods touching), some were open. And the final challenge! Make a second 100 face different from the first. For example, if your first one was open, find a way to have all rods touch each other. If you had a closed face, make an open one. "We’ll go around the circle and you can tell the group just a little bit about how you made this particular face. What changed about your strategy from the first time you did it? Was there something you had to do differently, something you guys talked about that was a challenge while you made it? Or something that came to mind while you were building it." 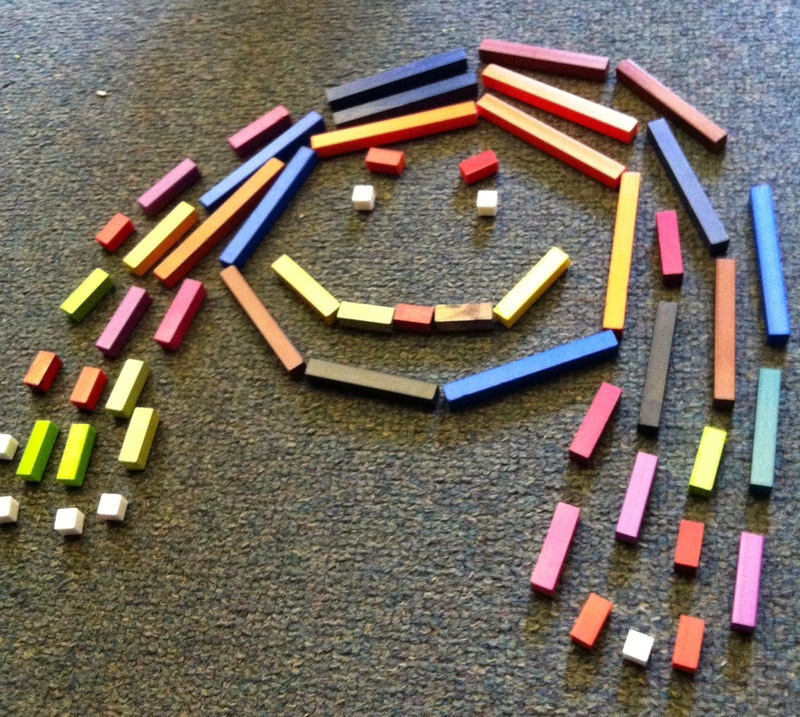 Girl: We started by just making a symmetry face and then counted them up and figured out we needed 24 more. So then we basically just added the hair with 24. 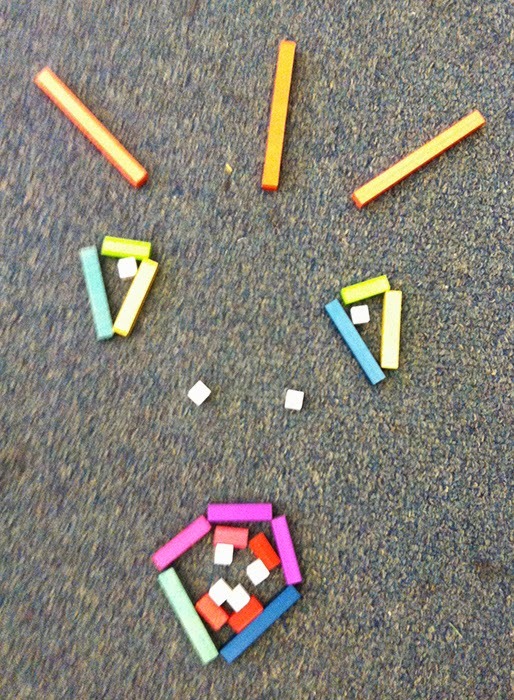 Then it wasn’t perfectly symmetrical so we kind of made it the same on each side. Me: And did it add all the way up to the hundred or did you get close? Girl: It equals to the hundred. Me (to boy): Is there anything else you want to add? Me: I saw you put the pencil down [the middle of the face). Want to show them what you did? [He puts pen down the center.] Do you see that there’s a red on each side, an orange on each side? Girl 1: At first we had a round face and we had eyes, a nose and mouth in it. 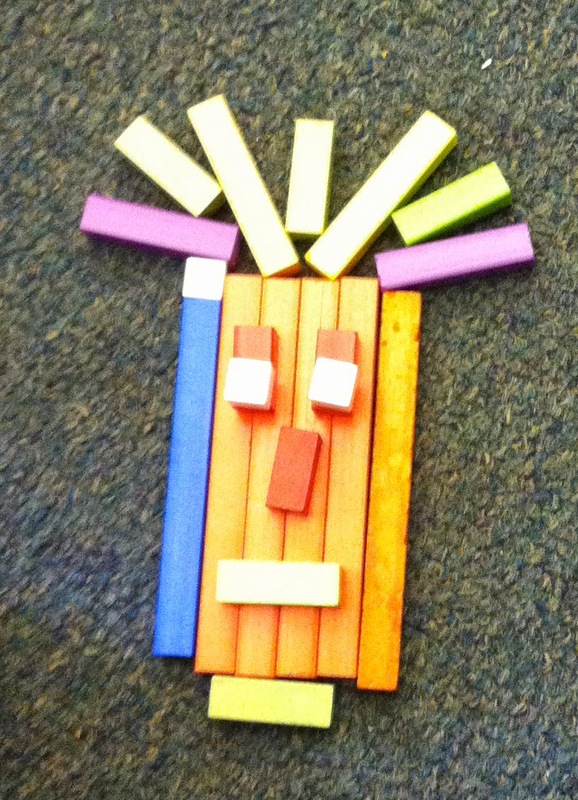 But this time we made the background of the face ten each so we have 90 here and then we used twos to make the face. Me: [Laughing] Because why? Why did I give you that challenge? 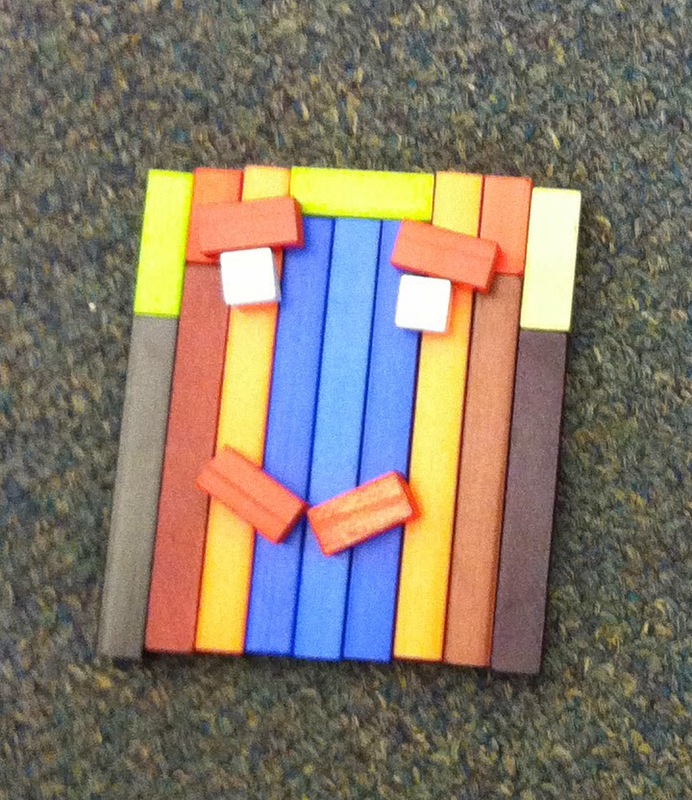 Girl 1: Because we finished only using 10s, 9s…and the last face wasn’t as symmetrical. So we decided to do four browns in the middle and two blacks on either side. But then if you counted them up there was only 80 on the bottom. So what we had to do is 4 + 4 is 8 plus 2 is 10 so we could only get up to 90 and if you let us use the 10 we could have made feet. Me: [Laughing] But that’s the thing, you have to work within the limits. 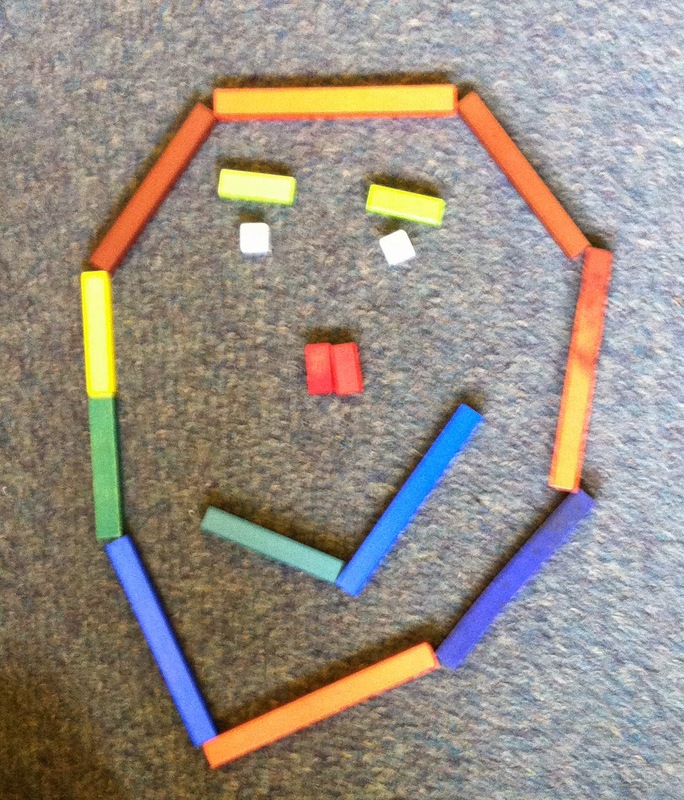 Boy 2: But then he was already making this other face on the ground and we just added some more to it. 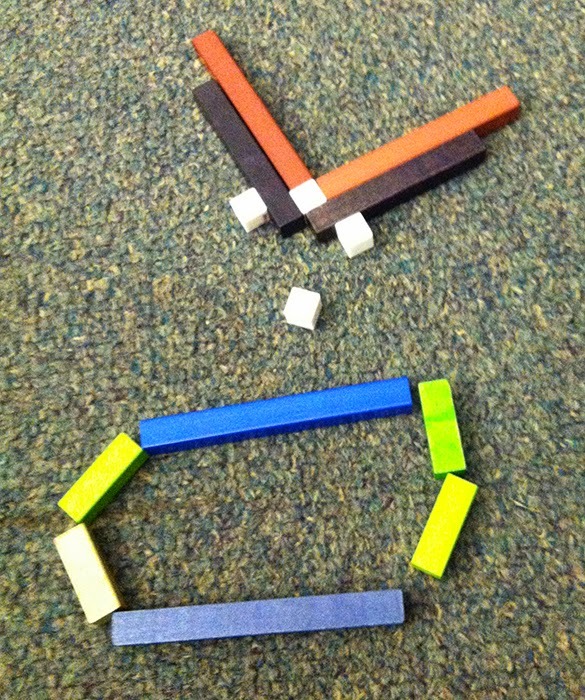 Boy 1: One of the newer things was we took away the triangular nose and put in these two [white blocks] and we added these red things. Me: Does it add up to 100? Boy 2: Mmm hmm. We got hair and you can [to other boy – can you hand me your pen? Thank you…laying the pen vertically down the center] it actually does go down and there are two teeth and two red things on either side. 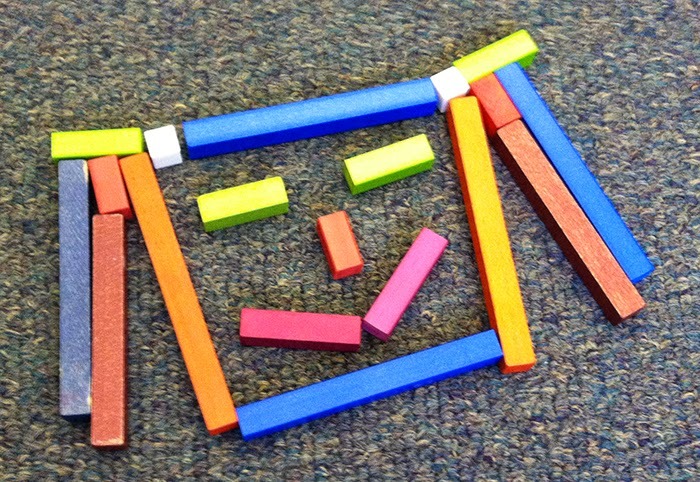 The conversation reveal thinking about sameness and differences and emergent thinking about symmetry and balance. The teacher and I were both extremely happy about the activity, engagement and conversations in the individual teams and the class as a whole. Next time I want to be make the constraints well, more constraining, like: "use only rods one through six." I think this would also be a good to do again with this same group so we can deepen and extend the idea of balance. 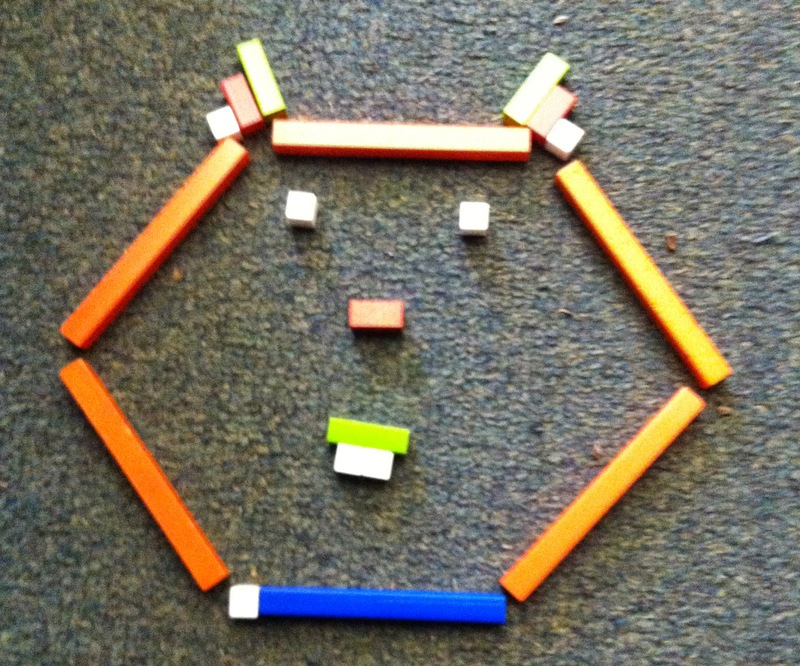 Malke, that's great that you did this activity - and got such great results in terms of thinking and talking. I like the idea of the further constraint too. I love this. I'm bookmarking this in case I have ever get the chance to teach younger children. I love all the different faces! New Dice Game: Variation on "Race to 100"